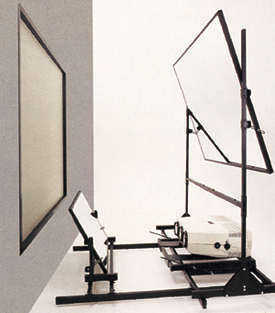 Rear Projection Screens, Medford, OR - ProScreen Inc.
ProScreen has a complete line of rigid rear screen displays as well as frames, including HW and self trim types as well as projector and mirror mounts, PTI, and PTII type using Mylar Mirrortec mirrors or special glass mirrors when required. ProScreen also produces flexible rear projection display film and anti-glare film for rear projection screens. We are proud to be a distributor of the complete DNP Supernova front, high constrast screens, flexible, motorized, manual and rigid screens. Click here to view a product brochure. ProScreen is a proud distributor of DNP ProScreen products for special visual edge imaging applications using Fresnel Lenticular and Fresnel Diffusion combinations. We also have DNP Supernova Front Screens, high contrast, motorized, video wall screens. We offer ProScreen DNP sizes up to 200″ diagonal for special display applications. We work with dealers, system integrators and custom installers throughout the U.S. and world markets. Please review the following ProScreen special visual edge technology rear projection screen displays. Proplex Diffusson – acrylic, rigid display in all sizes. Proglass Diffusion – glass display screens in all sizes. DNP Optical single element acrylic. DNP Optical double element acrylic. Mirrors film and first surface glass. ProTheater Systems includes projection screen with frame, projector mount and one or two mirrors with frame mount assembly. Dealer Support Products and Accessories. Tecshield- rear projection screen, anti-glare film protector with anti-glare picture quality enhancements. PSI Design- A unique state-of-the-art software program which assists the user in developing front and rear projection screen system requirements. Click here to view an interactive brightness demo for a DNP Screen. Click here to view other product presentations for a DNP Screen. All ProScreen projection screens and their accessories are covered by a limited ten-year warranty against defects in materials and workmanship. Complete warranty terms are available upon request.